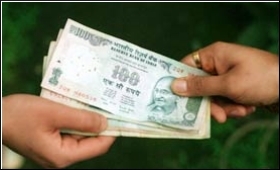 How a government employee starts accepting bribe - who is responsible? After lot of sleepless nights and hectic days of study a person passes a govt recruitment exam. As a fresher in Govt service, each candidate will be so excited to serve people and state. All of them try to deliver their best to serve the society. Their mind will be aganist corruption and bribe. Each of them thinks about bringing a small change from their side...Lets analyse what happens next. Beginner starts his official life with fresh mind filled with ethics, he thinks of best ways to do his job honestly and to serve people in the best way he could. He goes like this many days and one day a customer comes to his office and say his needs, the employee attends him very well and does his job done quickly which amazes the Customer. Now Customer is well satisfied and he tries to give some money even though the employee doesn't demand it. The customer forcibly put the money into employees' pocket and says "Keep this for peace of my mind" and unwillingly he accepts it. Days goes on and several other customers do the same. At first employee could resist this, but now he started expecting some "special" rewards for his service. So if some one doesn't pay some extra amount, he starts feeling irritated and finally he starts demanding money. Slowly, Slowly a good smart employee become a corrupted one. Some people accepts bribe to go on with their extravagant life , on the other side, there are many many jobs that do not pay even a starving wage and in such case people are forced to accept bribe for their basic living. Every thing except salary is rising, so Government should try to provide decent wage for their staffs and also try to control rise of cost of essential commodities. People have a common notion that nothing happens with out bribe. Some think the person giving the bribe is not as bad as the person receiving the bribe. We should start a different thinking, Say NO to giving or taking bribe. An officer is usually bribed for doing improper things which are out of law. Hence! One cannot exist without the other :) ..Once there are no givers then there will be no bribe takers. A big salute to all those honest and ethical people who execute their duties with out accepting a single penny as bribe. May You , your family and the generation following you be blessed.